ROBO-ONE Light 15th sponsored by Biped Robot Association, took place at Kanagawa Prefectural Youth Center in Yokohama City, Kanagawa Pref. on Sep 23, 2017. ROBO-ONE Light is a robot fight tournament for robots on the market, which are officially recognized by ROBO-ONE Committee. Beginner, who gets robot from the market and want to attend the ROBO-ONE Tournament, can attend the competition with his robot which is made from just robot kit. Custom-built robot, just the weight 1 kg or under (UK1) also can attend the tournament. Robots on the market, officially recognized by ROBO-ONE Committee, can attend the competition whether the robot adapt the 31st ROBO-ONE, the 15th ROBO-ONE Light Regulation and the 2nd ROBO-ONE auto (in English). 2) Custom-built robot weight except for the officially recognized robot is 1 kg or under (UK1). Custom-built robot has to adapt the 31st ROBO-ONE, the 15th ROBO-ONE Light Regulation and the 2nd ROBO-ONE auto (in English). In the tournament, custom-built robots handicapped by about 500 g compared with officially recognized kits such as KHR-3HV. It was interesting that how builder of custom robot UK1 overcame the weight handicap and which robot kit was able to win the tournament. However, it is necessary for getting championship of robot fight tournament to carry 3 important factors such as good body, good motion and good control. Eighty-six robots joined the 15th tournament. More than 45 robots were custom-built robot, UK1 (1kg or under). Other robots were officially recognized robots such as KHR-3HV. In the 15h tournament, custom-built UK1 robots could not overcome the weight handicap 500g. The Champion, Metallic Fighter by Morinaga-san was a officially recognized robot, KHR-3HV. The 2nd place Simanchu by JGSDF HTS Robot R&D Club was also a custom-built robot, KHR-3HV. 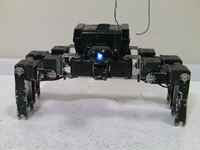 The 3rd place Little・puni by Osaka Sangyo University Puni was a custom-built robot, UK1 (1kg or under). 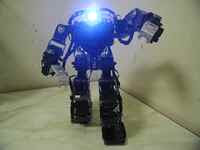 The 4th place HAM SIHOON_light by YELLOWTOOTH was also a custom-built robot, UK1. The results are here. The winner was Metallic Fighter. ROBO-ONE Light 1st took place on Mar 20, 2010, ROBO-ONE Light 2nd on May 22, 2010, ROBO-ONE Light 3rd on Oct 8, 2011, ROBO-ONE Light 4th on Mar 24, 2012, ROBO-ONE Light 5th on Sep 1, 2012, ROBO-ONE Light 10th on Mar 14, ROBO-ONE Light 11th on Sep 26, 2015, ROBO-ONE Light 12th on Feb 13, 2016, ROBO-ONE Light 13th on Sep 24, 2016 and ROBO-ONE Light 14th on Feb 25, 2017. The details were reported in this blog.